This rare and beautiful lacquered penwork card or gaming box dates to the early 19th century, circa 1815. The box is in good unrestored condition with a wonderful faded grandeur look and feel. This elegant and slender box is of casket form and stands on four wonderful brass paw feet with a pressed brass side ring to each side. The box is compartment fitted for storing packs of cards etc. The lid is features three pink hand-painted roses; the sides of box are decorated with scrolling leaves and flowers. 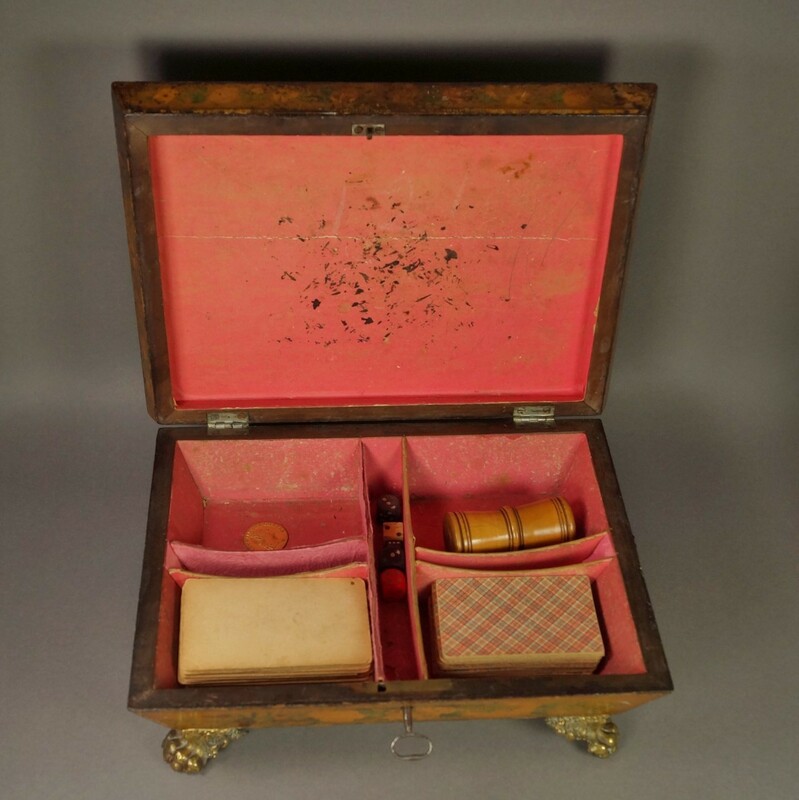 This box is original and unrestored; it is complete with its original card dividers and pink lining. We are including the assorted antique gaming items that came with the box when we purchased it. The lock works perfectly with the included key, using one revolution to the left. Please see 'Antique Boxes – Inside And Out for Eating, Drinking and Being Merry Work, Play and the Boudoir by Genevieve Cummins' page 252, Colour Plate 463 for a similar example. 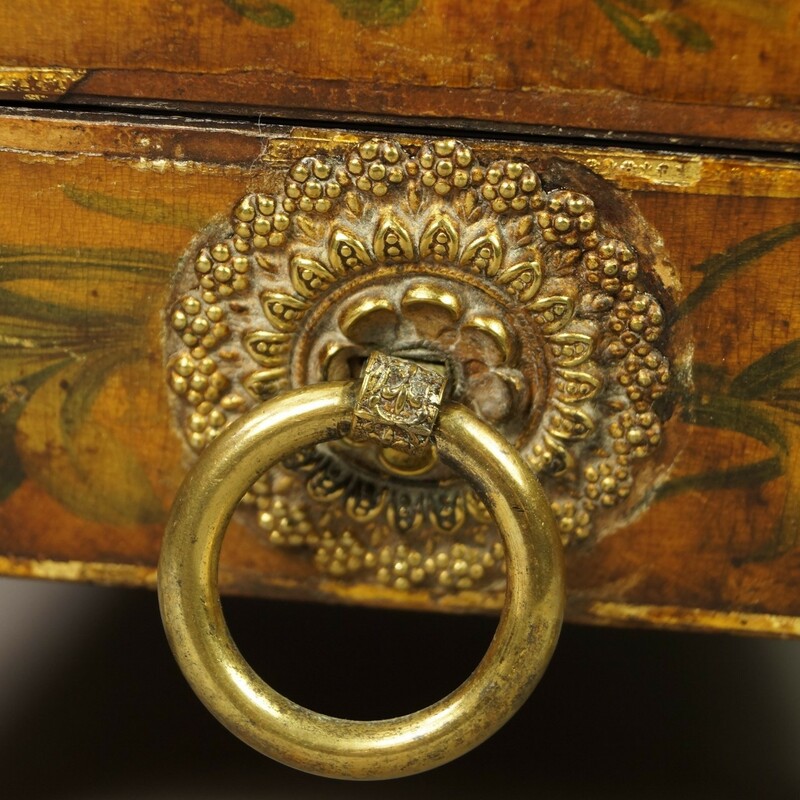 Condition: There is aged wear, scratches and losses to the lacquered surface and some wear to the gilt line that runs around the edges of the box. There are some marks and a horizontal scratch to the interior lid lining; there are some minor marks and perforations to the interior lining. There is some minor wobble to the two left feet. The decoration is unusual and highly decorative; it has a lovely natural patina from its 200 years of history. This item would display excellently in both a contemporary and traditional style interior.